As i said before, on my last post when i went to SM MOA, i bought a couple of things & i would do a separate post on it. I'll announce the winner of my giveaway later on. Since i plan to have long nails this Christmas, i better start taking really good care of my nails. The reason why i don't usually sport long nails is that i always need to use the computer which requires me to of course type & typing with long nails is a hard chore. Plus the fact that i always wash my hands which in a way makes my nails brittle & soft that leads to chip-ening of my nails. I vowed that i would take good care of my nails now that's why i decided to buy the nail strengthener (the pinkish one) & also the moisturizing top coat (the greenish one). I have already tried their top coat & i think it's just ok. I would just like to try this other top coat. Then when Kite & I went to Beauty & Butter, they are having a promo that you could buy 3 polishes for only Php100 so we bought 3 to test it out. They also give away 1 free polish for every customer who avails of their nail arts so i was given another free polish as well. Yay for freebies! I have bought this weeks ago but i wasn't able to post it. I think this bracelet is actually cute for it doesn't have the usual clamp. You lock it with a real cute lock! I'm showing this to you because this would likely be the prize for my next giveaway. On which for my regular readers know that i don't put a "GIVEAWAY ALERT" title on my post whenever i have one. I do my giveaway on my random post. With that said, it's time to pick out the winner! Please email me your shipping details at thiamere@kuririnmail.com. If the winner won;t be able to email me within the given time frame then i'll be picking out a new winner by then. So, Adz, make sure that you email asap,ok? There will be more giveaways,gals, don't lose heart. Hope y'all have a good start for your week! i love tfs!!! congrats to adz!! Congrats to the winner and I love your polish haul!!! damn, 3 away but congrat to the lucky winner!!! =D I already won one giveaway from you so I'm happy about that already. teehee. Wow, nagulat ako! Thanks to everyone who posted congratulations! It's my first time to win anything haha! I emailed you already! YAY! 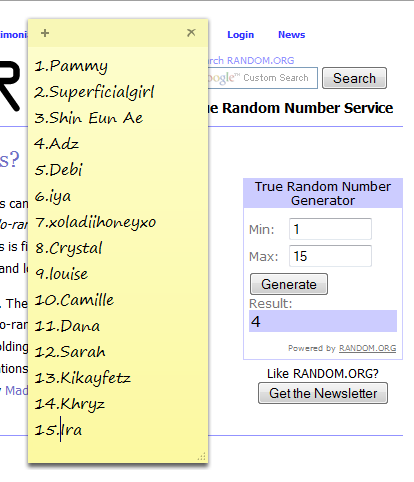 Congratulations to the giveaway winner, of course :). Sweets: Ice Cream Sandwich + a cute polish! What is your go-to eyeshadow? Bonding with your BFF is always fun!